This 5.1 mile loop hike is deceptively challenging. Views and pleasant ridge walking are paired with some steep ascents and descents. Views from the Fortune’s Cove trail. 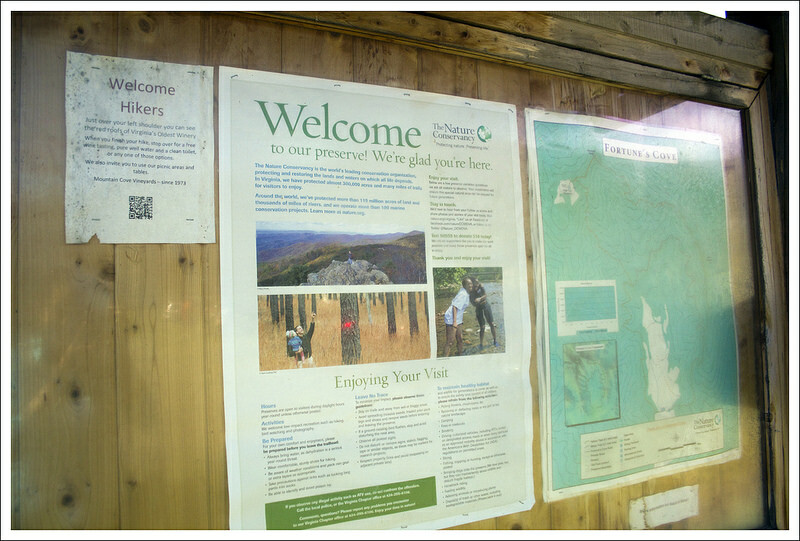 Below: The preserve at Fortune’s Cove is operated by the Nature Conservancy; The trails are all well-marked and carry the Conservancy logo; Informational panel at the trailhead. Wow – the first weekend of April 2014 was GORGEOUS! 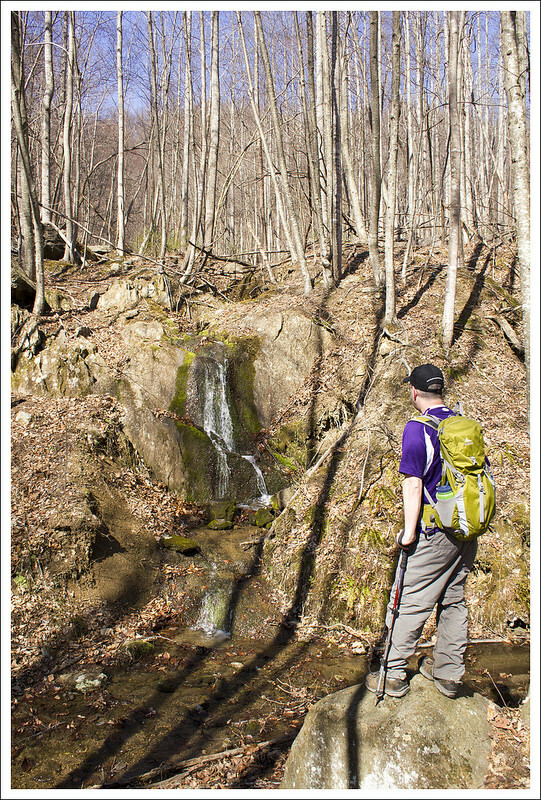 I think we (and every other hiker in Virginia) decided to hit the trails. We tossed around the idea of going backpacking, but we just didn’t get our act together. We perused our hiking book collection, a bunch of maps and several websites. 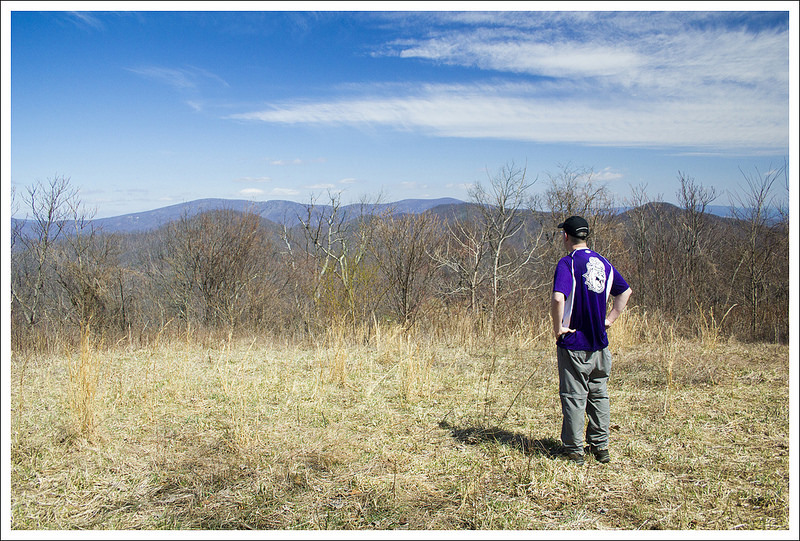 We settled on a hike we found on Hiking Upward – Fortune’s Cove. It wasn’t a long drive from our house and looked like a good choice for early-season hiking. We got to the trailhead parking lot right around 10:00 and found it jam-packed. There was one group of about 15 hikers getting ready to depart. I feel a little bad saying this, but I’m always a little deflated when I get someplace and find that we’re going to have lots of company on our hike. We set out immediately, in hopes of putting a little distance between ourselves and the large group. We hike quite a bit faster than most social groups, but the self-inflicted pressure to keep moving made me feel like I couldn’t pause to take photos. I took most of my pictures while still walking, so they might be a little blurry or random. We passed this small, but pretty, waterfall early in the hike. We hiked the trail in the opposite direction of Hiking Upward. In retrospect, I think I’d go the way their directions suggested – the ascent is longer, but more gradual. We started our hike at the end of the parking lot with the informational bulletin board. The trail actually starts from the main road, right before the turn-off to the parking lot. Initially, the hike rambled along over rolling hills, climbing gradually uphill above the cove. After crossing a small wooden footbridge over a creek, we were treated to a small but pretty waterfall. After the waterfall the hike followed a series of switchbacks uphill. We eventually crossed a fire road and continued a short flat section of trail. Soon, we reached a junction. At this point, you can take the shorter, easier Lower Loop around the cove, or follow the challenging, longer Upper Loop. We wanted views, so we went with the Upper Loop. 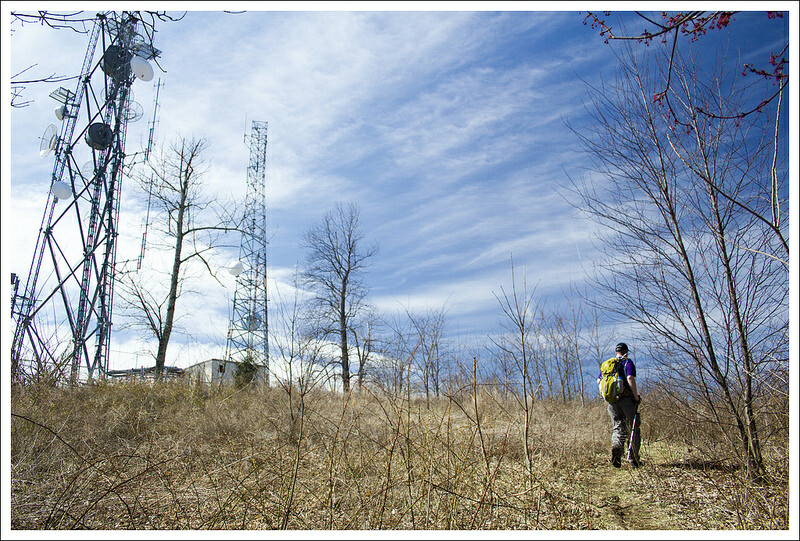 From the junction to the cell towers atop the high knob, the climbing was pretty brutal – I’m not going to lie. Sometimes there were switchbacks to ease the ascent, but other times the trail went straight up the mountainside. We were still hiking hard to stay ahead of the group, so I was very relieved when the towers came into view through the trees. The climb was almost DONE! Near the towers, the trail comes to another junction. One spur leads to the tower and several decent views (although – the presence of towers really does detract from the beauty of the views). The other direction continues to follow the Upper Loop trail around the perimeter of the cove. The remainder of the loop is rolling hills and ridge walking. There are several big descents and a couple short, steep ascents, but all the tough uphill is behind you at this point. We chose to have lunch at the first little rocky outcropping with views. It was nice to see Wintergreen and The Priest through a few (still bare) trees. There was a ton of mountain laurel on the back half of this hike. It should be beautiful in late May – early June! Adam traverses steps on one of the steeper uphill sections. Below: the trail junction of the Upper and Lower Loop Trails; Adam approaches the towers at the high point of the hike; The views from the tower area are decent, but a little obstructed by trees. Some of the downhill on the back loop was very steep and covered with deep, slick, dry leaves. We were both really thankful to have trekking poles. We continued to enjoy occasional views, mostly looking into the cove, as the hike progressed. At one point, we were hiking along in companionable silence, when suddenly a large German Shepherd bounded in our direction, barking loudly – fortunately he was friendly. It turned out that a couple of hikers had two unleashed dogs on the trail. We love dogs, but they’re not allowed in Fortune’s Cove. The restriction is clearly marked at trail entries and the rules are posted online, so please leave your dog home! Eventually the Upper Loop and Lower Loop met back up at the final trail junction of the hike. The last bit of the hike was fairly consistent, knee-grinding downhill. Adam asked me to hike in front of him, so he could ‘grimace in pain’ in the rear. I was hiking along, when out of the blue, Adam bellowed and shouted. At first I thought he hurt himself, but it turned out that a gigantic black snake had just slithered across his feet. The thing was easily five feet long. I love snakes – Adam is less fond. Through the trees, we could see our car in the parking lot drawing closer and closer. 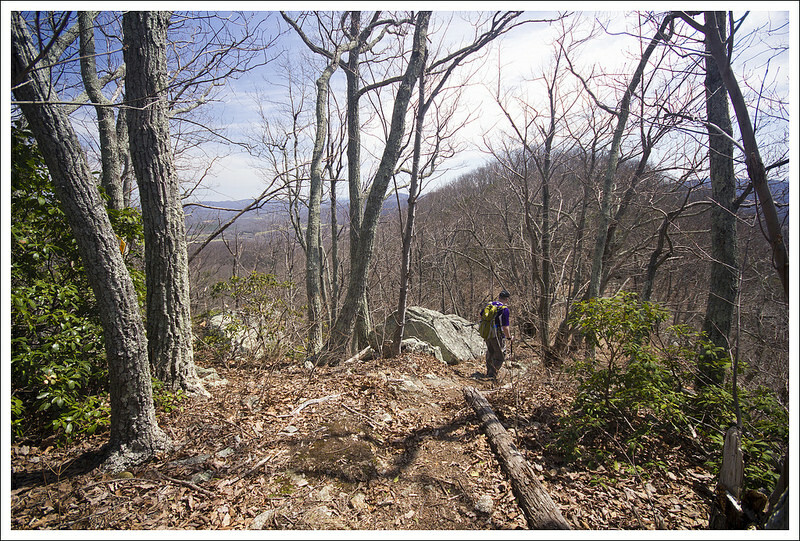 We walked the last little bit of trail, enjoying the budding and blossoming trees at the lower elevations. 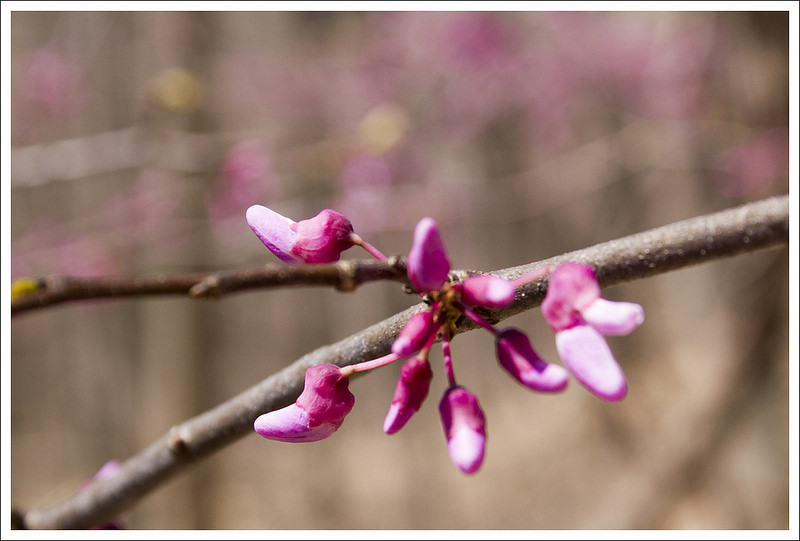 We saw cherry, redbud and pear all starting to flower. It was a great hike for a pretty spring day. There were nice views through the trees on the descent. 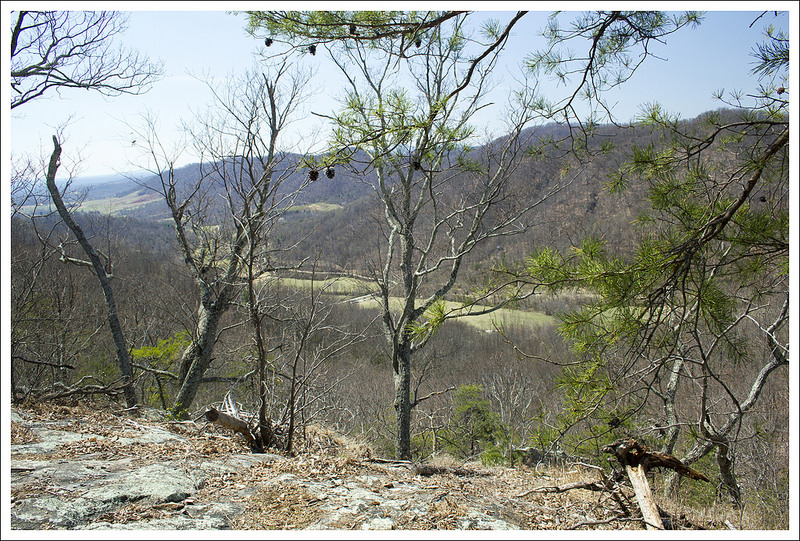 Below: Our lunch spot; Abundant mountain laurel, Nice mountain views. 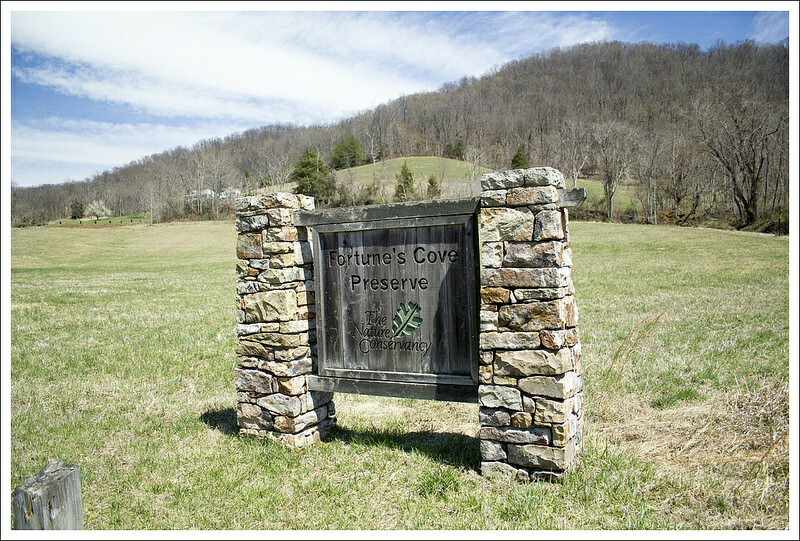 Fortune’s Cove Preserve consists of 755 acres that was donated by Jane Heyward to The Nature Conservancy. 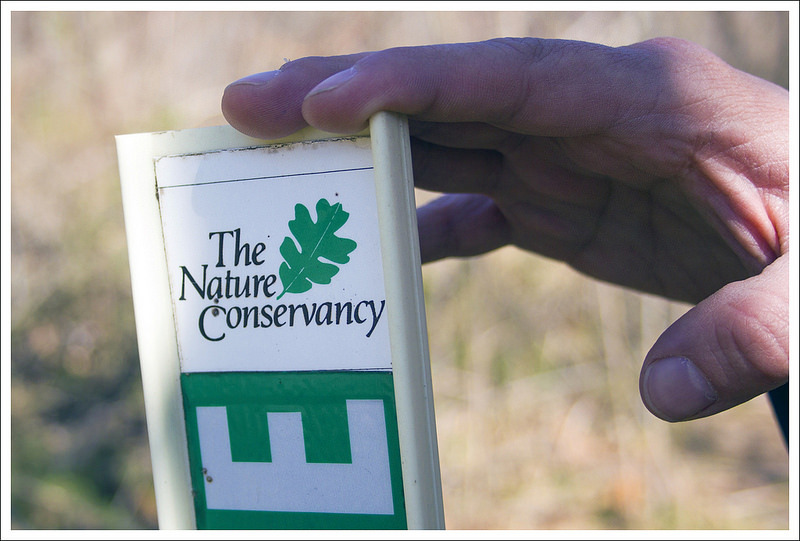 The staff and volunteers help maintain this land and hiking trails. As Christine mentioned, when we arrived at Fortune’s Cove, there were a ton of cars in the parking lot and a bunch of hikers ready to hit the trail. I told Christine “Grab your stuff quickly and let’s get going.” We didn’t want to experience this hike with a larger group and having to play leapfrog up the trail as we stop to take pictures. I know that some people like to meet new people and enjoy the outdoors as a group, but we tend to hike with just the two of us or just another couple of people. When we took our first pause for photos, we could see the group approaching, so we rushed ahead. In fact, I would say we ascended the trail much faster than normal so we could stop to take photos at all. Since this was one of our first hike with real elevation change in a while, we probably pushed ourselves harder than we wanted. From the ridge, you could see the winding road through the cove. 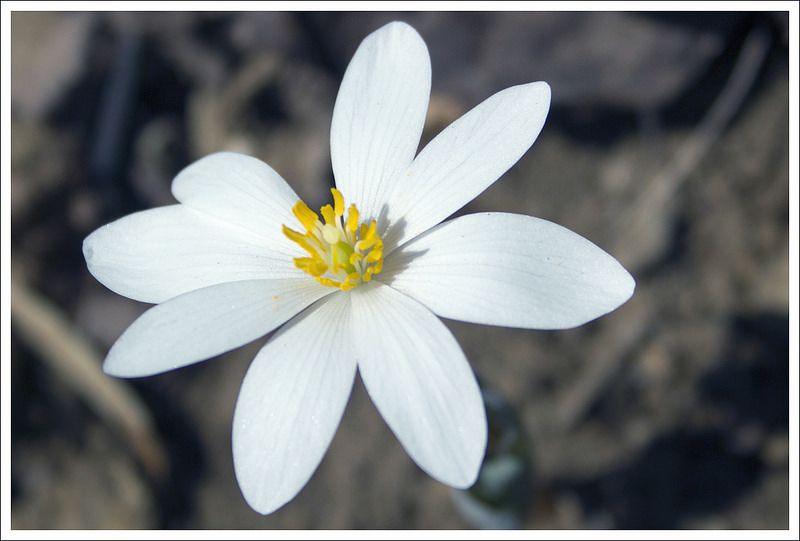 Below: More views on the way down; Blooming bloodroot; Redbuds are started to bloom, too! From the parking lot and behind the large trail map of the preserve, we walked up the road about 20 yards and then saw the trail sign on the right of the road that marked the start of the trail. The yellow-blazed trail starts off on a small ascent through a serene, wooded area. You can see glimpses of the farmland to the right of the trail as you skirt around the property. Eventually you will cross a couple of bridges over some creek beds and see a small, yet picturesque waterfall along the lefthand side of the trail around .75 miles. Continuing from this point, the trail starts a more steady ascent. 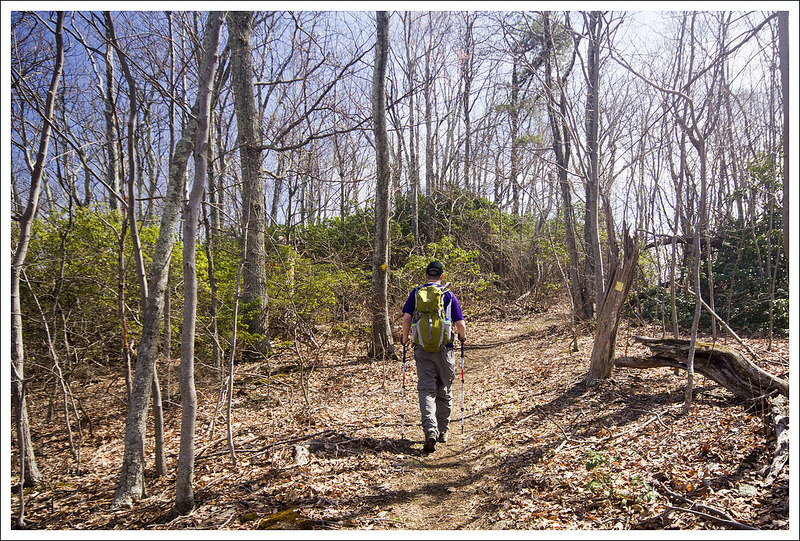 At 1.1 miles, you reach the intersection with the white-blazed lower loop trail. We took the upper loop trail, which had a warning sign for the steepness of the trail. This truly was no joke as the trail had us slogging up the mountainside. At 2.25 miles, we finally reached the top summit. There was a small trail (only a tenth of a mile) to the left which led to the top of High Top Mountain, which had a large cell tower at the top. The view was obstructed around us and being near a large tower didn’t make us feel like we were getting away to nature. We rejoined the upper loop trail and continued on our hike. We were now doing ridge-walking, so the toughest bit of climbing was behind us. We took a brief rest to eat our packed lunch while seeing the obstructed views of The Priest and Wintergreen across the valley in front of us. We pressed along the ridge hike, which quickly began to lead back down the mountain. 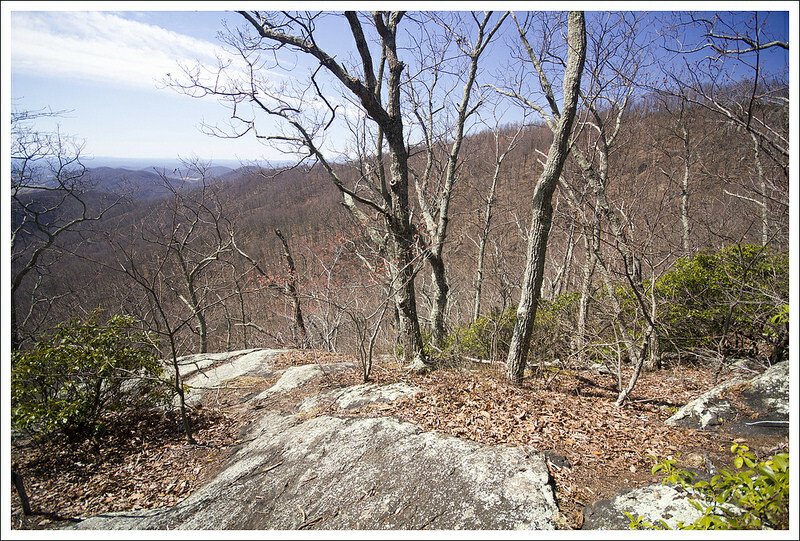 We were pleased to see there were several spots along the trail that led to some outcroppings of rocks with open views. 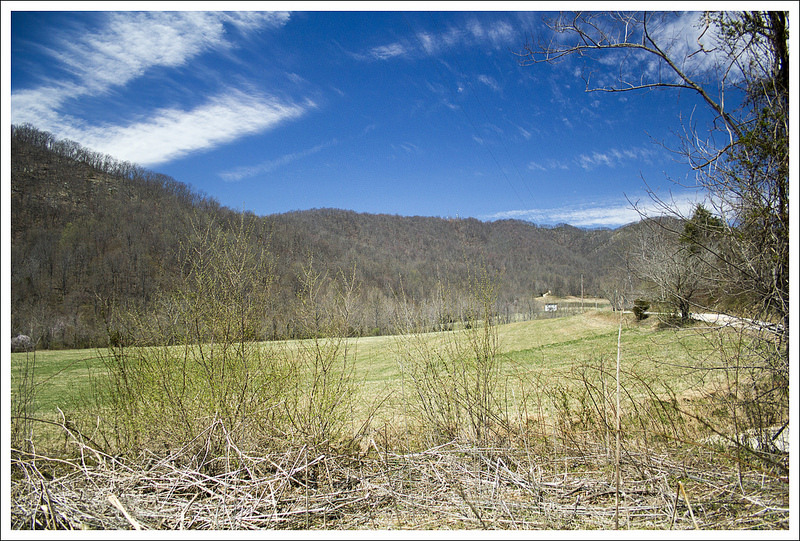 The views below sum up what I picture when I think of Central Virginia – rolling mountains and farm houses. We continued down the steep trail, which had my knees feeling some pain. 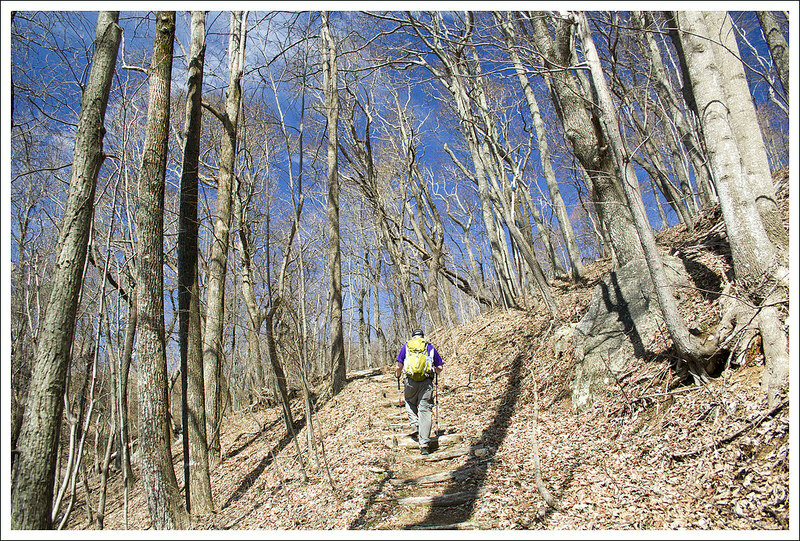 At 4.4 miles, you reach another intersection with the white-blazed lower loop trail. We continued down the mountain and made our way back to our car at 5.1 miles, passing through two blue posts before reaching the road and parking lot. The cove from the parking lot at the bottom. 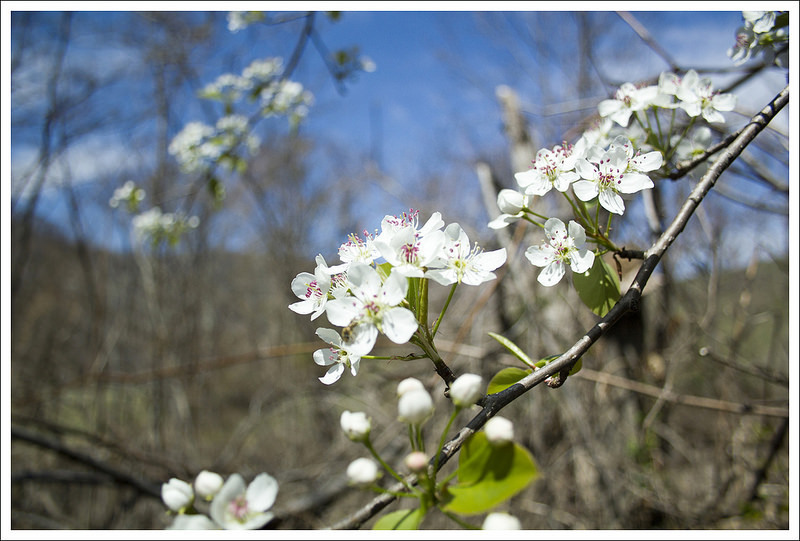 Below: Pear trees blooming; Blue Mountain Barrel House is just a few miles down Rt. 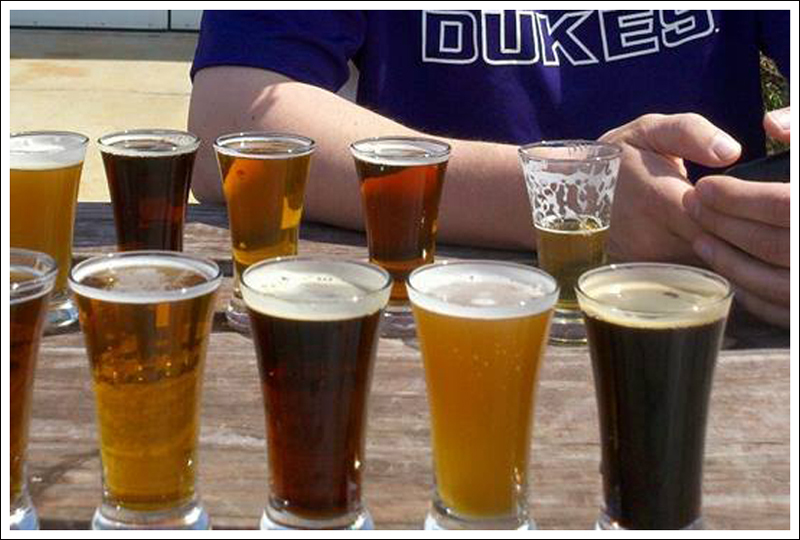 29; Beers! 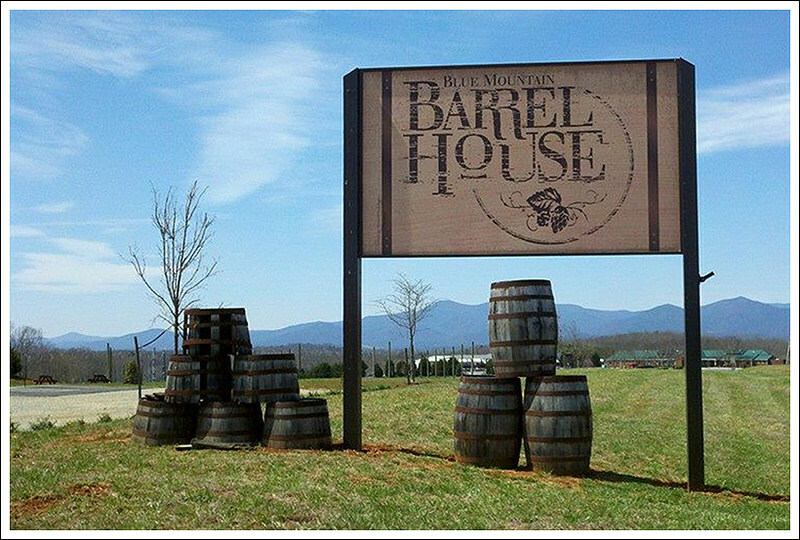 After the hike, we decided we had earned a trip to the nearby Blue Mountain Barrel House to sample some beer and get a snack from the food truck located outside. 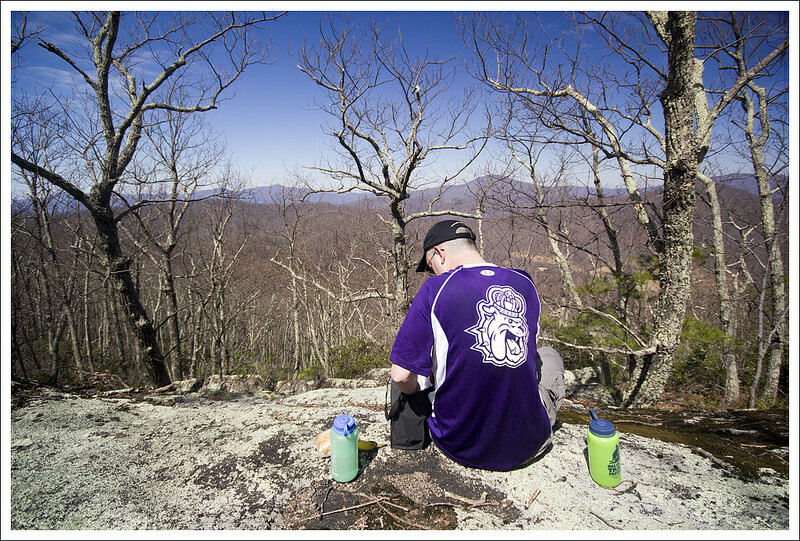 We enjoyed sitting outside with a few beers and were able to look out into the mountains on a gorgeous spring day. If wine is more of your thing, you can get samples from March-November on Wednesday-Sunday afternoons at Mountain Cove Vineyards, Virginia’s oldest vineyard. Difficulty – 4. There is some pretty serious climbing on this hike. It surprised us how challenging it was! Trail Conditions – 4. The trail was in great shape in most places. There were a couple mucky spots near drainage, and dry, fallen leaves made some of the descents slippery. Views – 3. 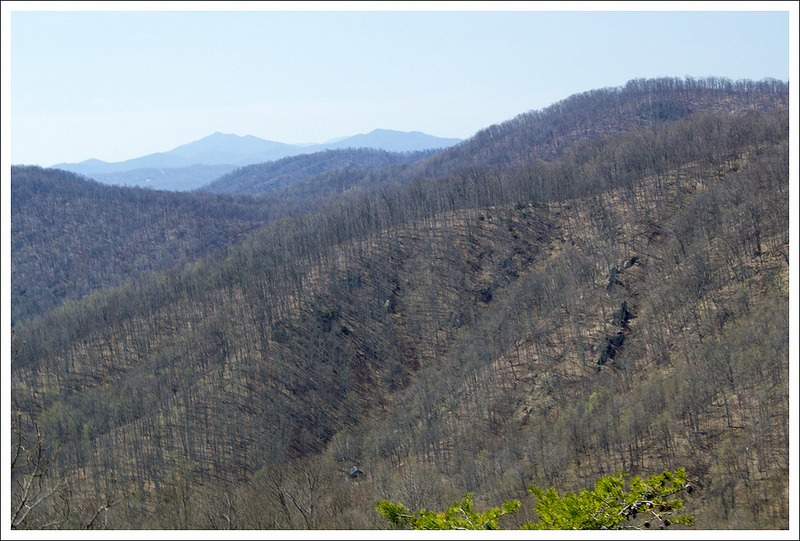 From the cell towers atop the High Knob to the junction with the Lower Loop, there are nice views in many spots along the trail. Even though there are many views, we’ve marked this down to a 3 because most of the viewpoints are partially obstructed. Streams/Waterfalls – 2. There is a small waterfall that probably only runs part of the year on the early part of this hike. Wildlife – 2. We didn’t see anything but a few birds and squirrels. DOGS ARE NOT ALLOWED ON THIS PRESERVE! Ease to Navigate – 5. The trails on this preserve are more abundantly marked/blazed than almost any other place we’ve been. Solitude –1. 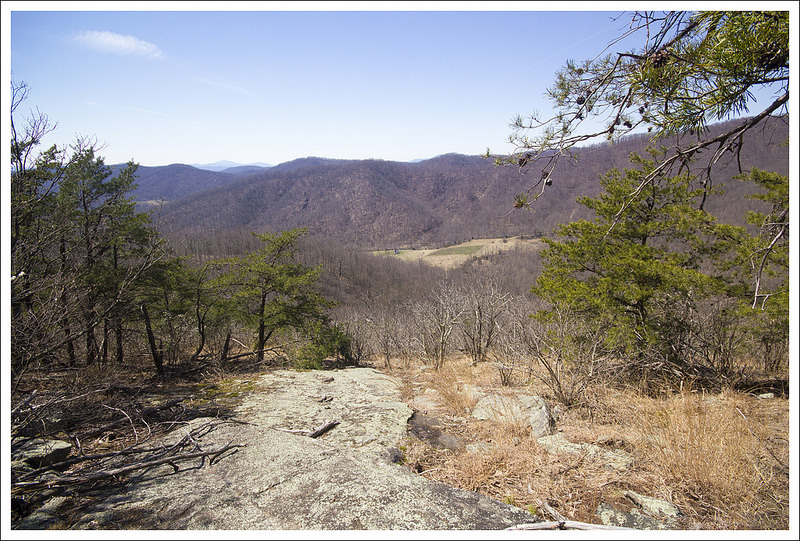 We had heard this place wasn’t well known or popular, but on the day we went, we encountered a large group people hiking together (shout out to the PATC – Charlottesville Chapter) , plus about a dozen groups of 2-4 people. It was a very busy day on the trail. We’re not sure if this is the norm, but we’d give this hike low marks for solitude. 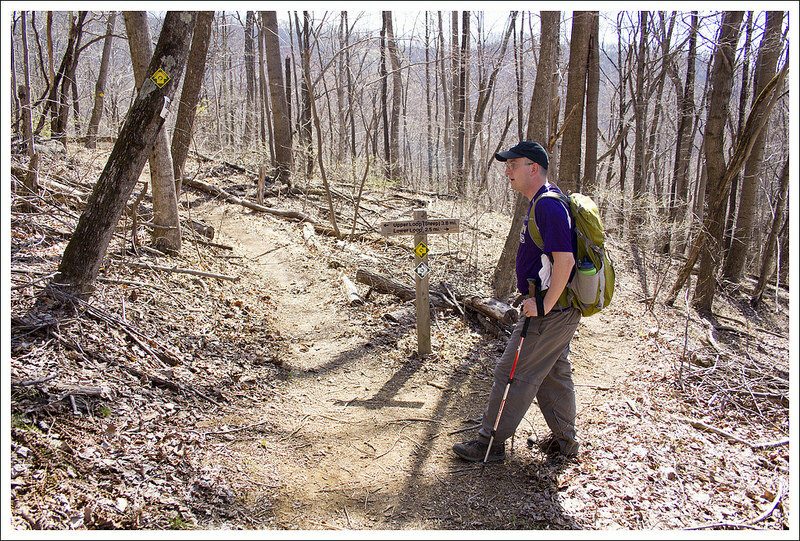 Directions to trailhead: From Charlottesville, head south on US-29 for 28 miles. Take a right on State Route 718. Follow this for 1.6 miles and take a right on to State Route 651. Follow this for 1.6 miles, passing Mountain Cove Vineyards on the right and then reaching the small parking lot. The way we approached the route, was walk on the road past the large trail map board about 20 yards. You’ll see the trail post to mark the start of the trail on the right side of the road.